The following is our review of Now D-Mannose Powder. This product claims to help cleanse the urinary tract and maintain a healthy bladder lining. D-Mannose is a type of sugar related to glucose. 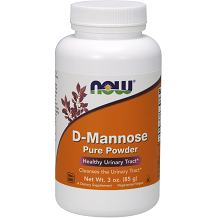 Clinical studies have demonstrated that , when taken regularly, D-mannose promotes normal natural urinary tract function by cleansing and maintaining the health of the bladder lining. D-mannose is used for preventing urinary tract infections (UTIs) and treating carbohydrate-deficient glycoprotein syndrome, an inherited metabolic disorder. D-mannose might treat the deficiency which is, in fact, caused by a genetic defect that causes abnormal breakdown and production of mannose. D-mannose might stop certain types of bacteria from sticking to the walls of the urinary tract,which, in effect cause infection. There is 85g of D-Mannose powder in this product. It is suggested to take 1 level teaspoon 1 to 2 times daily. You should take it with water or unsweetened juice, such as unsweetened cranberry juice. The powder needs to be stored in a cool, dry place after opening. This product is meant for adults only. If you are pregnant or are nursing, taking medication, or have any medical condition, you will need to consult with a medical professional first. At 3oz. this product will cost you $31.99. At 6oz. this product will cost you $59.99. The price is a bit heavy and it doesn’t offer you any sort of discount when purchased online. It doesn’t offer any sort of special for bulk purchases either. The product claims to guarantee freshness of their products through the usage of Ageless oxygen absorbers which absorb oxygen and help control humidity throughout the life of the product. They also use gas flushing which is a process used during package filling where an odorless, tasteless gas is quickly injected into the package to expel oxygen prior to sealing. Desiccants are used to to absorb moisture during packaging as well as help control moisture in certain natural products until the package is opened by the consumer. There is also product-specific packaging used to keep ensure the freshness of the product. Lastly, the products are stored according to climate control and ensure freshness efficacy through the “Best By” date. Returns policy only applies to products purchased from www.now-2-u.com or phone orders and not from other websites or retail stores. Customers should consult the returns policy of the place of purchase. New, unopened items that are purchased through now-2-u.com can be returned within 60 days for a full refund minus any shipping fees. Payments made with a credit card will be refunded to the card used for your order. A 15% restocking fee may be applied to some orders. Returns will not be accepted after 120 days. Any damaged or wrongly-shipped products will be refunded with shipping costs upon being returned to us. For the company to process your return, the product will need to be returned to them unless there are reasonable circumstances why this cannot be done. Empty bottles or bottles less than half full will not be credited unless there are reasonable circumstances. 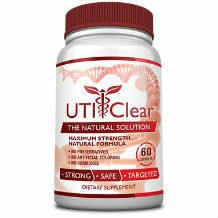 This product seems to offer a good treatment for UTIs. We just found that the price is a bit heavy when compared to its competitors online and there are no special discounts whatsoever.